Less than 12 months on and Corel have launched PaintShop Pro X7 - the 17th instalment of the extensive photo editing suite. Featuring new tools such as Magic Fill, Shape/Text cutters and XMP support for raw files, other new or improved features include a New Image dialogue box, Drag & Drop layers and Smart Edge technology for brushes. Most importantly, Corel say that the performance has been improved which is really the only thing that has been letting the program down in the past. In this full test, we'll be testing that performance improvement – and other features. 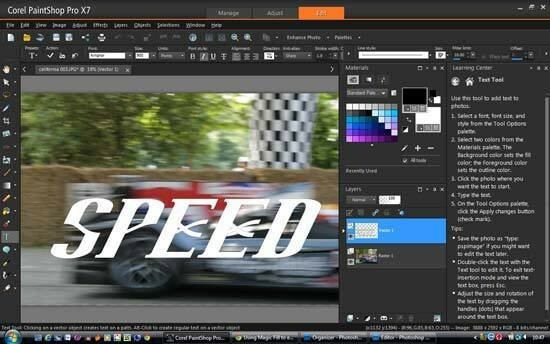 Paintshop Pro X7 is available as a standard version for £59.99 or the Ultimate version (which we tested) for £79.99. 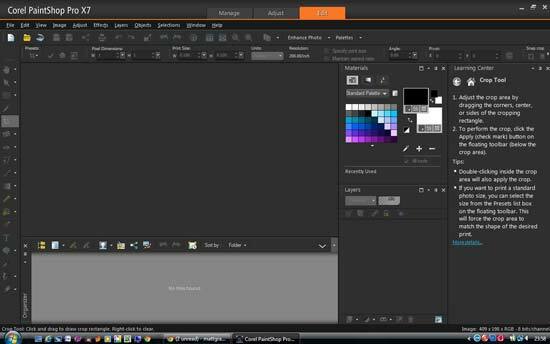 Installation of PaintShop Pro X7 was tricky, however this wasn't on the part of the program. The desktop computer we used on Windows 7 Ultimate got an error code that we couldn't fix, so we tried it on a laptop running Vista. We also got an Error code from that and had to repair .NET framework but it eventually worked. It's unlikely that you'll come across this problem, but if you do, there are solutions online available to follow. Installation took around 8 minutes after downloading from the Corel website. That's not including the time it takes to read the Terms & Conditions. Registering the product will allow you to download some free products. We had three selections of a KPT Collection which is a range of plug-ins, a PaintShop Scripting guide and finally Creative Content which increases your range of brushes, gradients, line styles etc. They're pretty small with the largest file only 135Mb. If you've used Corel PaintShop Pro X7 before then you'll be familiar with the controls. If not, then it shouldn't take too long to get used to them. The program is split into three main sections which are tabbed at the top of the window. Interestingly, the third Edit page is defaulted to open first. Edit is accompanied by Manage and Adjust. Manage allows you to tag and amend information about the photographs you import. Tagging images takes a while to do and can be tedious, but is more convenient in the future when you need to find a certain picture. You can also rate images, add dates and people to them for easier searching later. 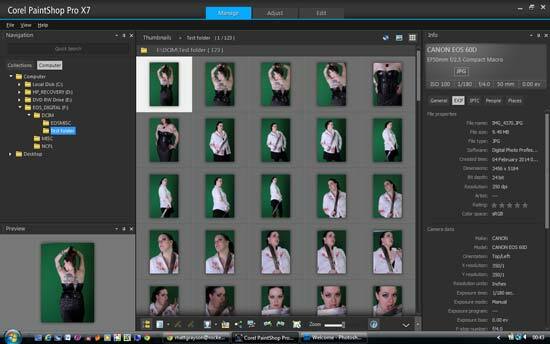 In Adjust, you can change basic qualities to the pictures you have open such as white-balance, contrast or clarity. You can also tone map, reduce noise and high pass sharpen. To the right of the picture, there's also a number of creative effects. There are a number of new features available on Corel PaintShop Pro X7, so let's take a look at some of those. Magic Fill is a new feature that has a similar end game to content aware rescaling which was introduced to Photoshop on CS4. It's extremely easy to use by simply selecting the item you wish to have filled and clicking the Magic Fill button in the Tool palette. It's similar to the Patch tool but seems to work a lot better. The great thing is that you don't have to be precise with your selection. 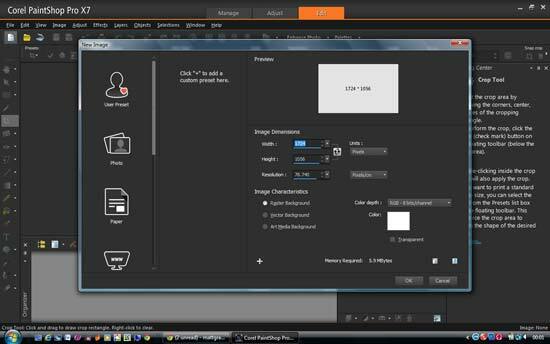 In fact, Corel recommend including areas of background so it can decipher between what it needs to remove and keep. The Text Cutout is an interesting feature that allows you to place text over an image and cut it out so that the backing image serves as a pattern on the text. Corel have managed to make this process immensely easy as well by placing the text over the image and clicking the Text Cutter in the Tool palette when you're ready. The new text image is created as a new layer with a clear background which can be saved ready to place over other projects. Another notable improvement is XMP support for raw files. These files hold metadata and allow you to embed this information directly into your raw files.